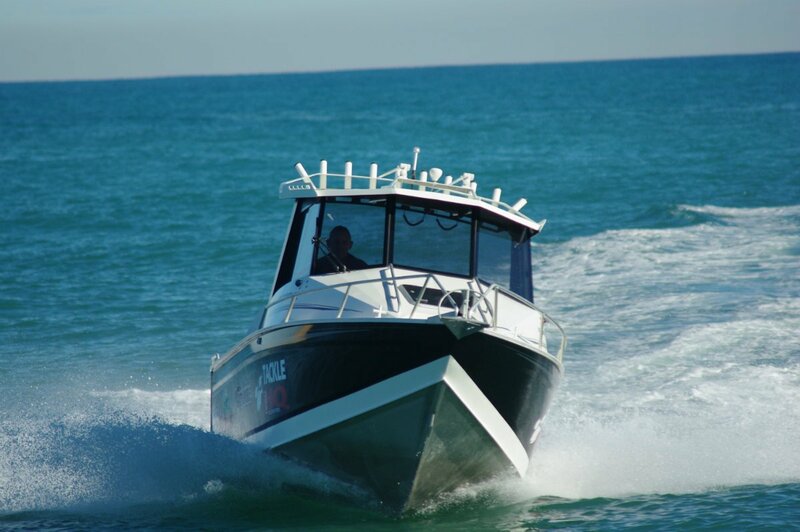 Where some fishermen practice catch and release, the trailers for all Bar Crushers do the same; but not with fish – the trailers have an excellent system allowing easy one-man drive off, drive on of the boat. There is much else that is thoughtful about the Bar Crusher 780HT (for hardtop). Sheer strength is a major feature. The hull’s plating – 4mm sides and 5mm bottom – is massively stiffened by fore and aft and transverse frames that reach from deck to bottom. A sharp bottom that combines with a water ballasting system to give both a softer ride and steadiness once stopped. The 780 is pleasantly butch; generally, if it doesn’t need it it doesn’t have it – soft touches here and there, carpet, and things like that. On the other hand, if it does need it Bar Crusher puts it in to a high standard. Such as a boat capable of coping with rough waters needs things to hang on to, and there are not only grab rails in all the usual places but also overhead under the hardtop. The hardtop is lined – it provides some insulation and sound deadening – in black like every other surface in that space. This removes glare, makes the screen easier to read and helps the no nonsense look. 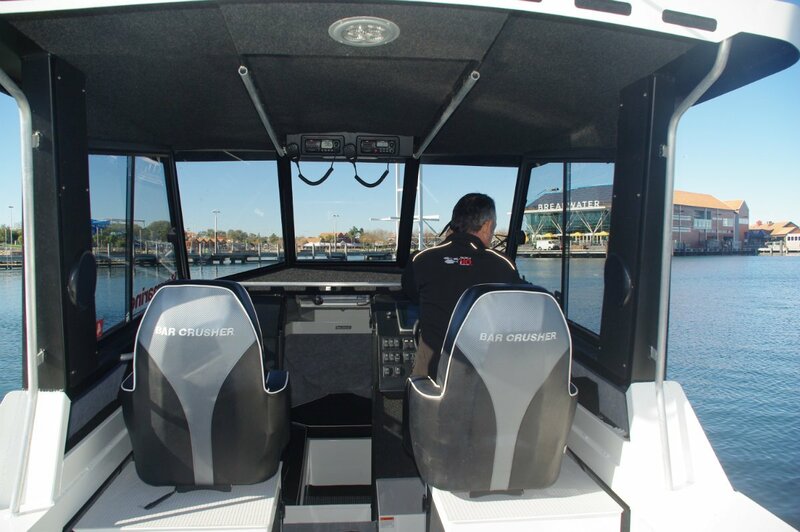 On the subject of screens, there is just one: a big Raymarine that covers everything in the navigation, fish finding and engine monitoring fields, controlled by touch screen. The windscreen is full height but shaded by a decent sized eyebrow, and there is opening side glass and a fore hatch to provide ventilation. The fore hatch is the natural way forward due to the narrow side deck, but the rails on the hardtop allow the alternative. Another thing the hardtop does is carry probably the most rocket launchers of any trailer boat – ten (and there are four more sockets attached to a side pocket). So does the 780 have the facilities to justify all those rods? It does look the part. The chequer plate deck has a reeded covering to cushion the feet and make for easy clean up – with a fresh water wash down; a clear topped circulating bait tank and a bait board feed the hooks. The coaming, which is wide enough for comfortable sitting, rests against the thighs at a reassuring height. There is safe standing for two or three and sitting for five. The rear bench is acceptable, the two main seats excellent, incorporating bolsters, form fitting squabs and sides, and deep padding. They have a lot more room than average due to the narrow side decks, giving easy access between them to the cabin. The lined cabin has full length bunks and a simple but effective door: a pair of tracks takes a slide-in piece of plywood. Fit it for road trips when you want a lock up space; otherwise leave it at home. Storage is good, with the usual side pockets, plus big spaces below the bunks and seats. Ancillary equipment is top quality: effective windscreen wiper, Sarca anchor (an Australian-made success story), Fusion stereo and an excellent scuba ladder. 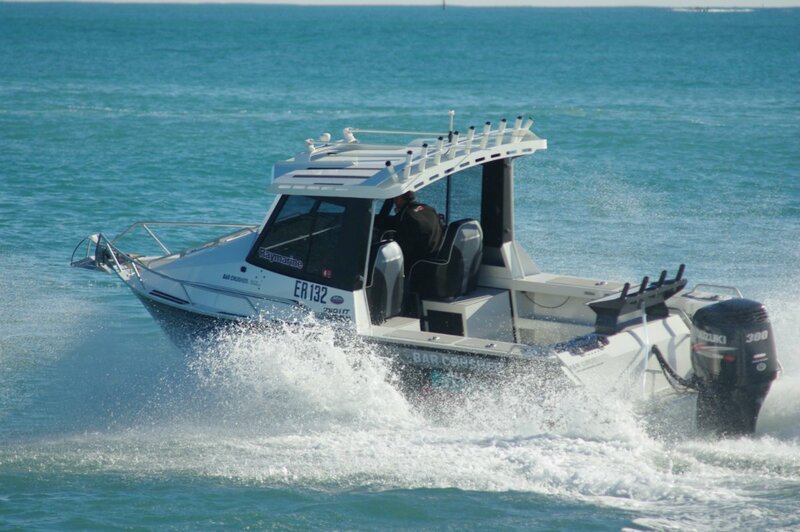 Recommended maximum power is 300hp, and that is what our Suzuki four-stroke delivered. It did not feel so much over as thoroughly powered: the Bar Crusher was able to use it but would have been satisfied with less. This was a particularly pleasant boat to drive. Progress was smooth at all speeds, response to wheel was light and accurate, and savagely hard turns (you feel obliged to make some) utterly free of ventilation.